Get the Right Size: One size does not fit all. A Chihuahua and a Great Dane have different needs when it comes to toys. Make sure pets have a gleeful holiday by giving them toys that are the correct size. “Balls should be small enough to carry, but not so small they can be swallowed or lodged in a dog’s or cat’s throat,” Becker said in a statement. On the contrary, a toy should not be too big. “Pets should be able to easily handle a toy with their mouth or paws,” she said. If they are struggling, the toy is too large. Ensure a Proper Fit: Oh what fun it is to dress in holiday garb in December. However, “children’s clothing should never be put on pets,” warns Becker. “Clothes that don’t fit properly could potentially choke a pet or get caught on something, trapping a pet,” she said. Instead, there’s numerous items of celebratory holiday clothing made specifically for pets. From Santa and Mrs. Claus costumes for cats and holiday sweaters for dogs, to simple jingle bell collars or Hanukah bows, there’s something for every pet. Age Appropriate: Dogs and cats of all ages need love, especially during the holidays, but puppies, kittens, and senior pets have different needs. Many companies make age specific nutrition formulas that cater specifically to a pet’s life stage. Becker said a great example is edible dental chews for puppies. ”They not only clean teeth and freshen breath, but are specially sized for puppies three months and older for easy chewing,” she said. On the opposite end of the spectrum, older pets may require toys that are softer to chew, treats that help joint health or brushes that are gentler on skin. “As a rule of thumb, pets are considered older when they’ve reached half of their life expectancy,” said Becker. 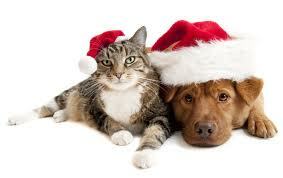 Going Green: Eighty percent of pet parents plan to buy pets a special something for the holidays. With all the pet toys, beds, collars and leads being placed under the Christmas tree or Hanukkah bush this holiday, it’s time to help pets do their part by thinking green this season. “There are so many amazingly stylish and eco-conscious products out there for your pet, it makes it easy to go green,” Becker said. Several companies offer an entire line of beds, collars, toys and leads that are both fashionable and planet-friendly. In addition, Becker suggests reaching for a toy that is stuffing-free. Comfortable Bedding: There are so many reasons to give dogs and cats a new bed for the holidays. First of all, it gives them a feeling of safety, especially with multiple guests coming through the house. It can also fix physical challenges as they age. Proper Nutrition: Various studies suggest that people gain between one and ten pounds during the holidays. Even seemingly harmless foods can do more harm than good. “Grapes and raisins can cause irreversible damage to the kidneys and ingesting even as few as four to five grapes or raisins can be poisonous to a 20 pound dog,” she said. Instead, opt for a beautifully festive splurge, such as all-natural treats that are attractively packaged and look just like human food – without the negative side effects. Training: The hustle and bustle of the holidays can be stressful for anyone, but don’t forget that dogs and cats can feel stress too. The perfect solution? Gift cards that can be used for dog training classes, which is the perfect gift for both pet and pet parent during the holidays. A short refresher course can do wonders for pets during the busy season.